A week ago I wrote two posts, one about Under Tower Peak, the thriller I had begun reading, and one about The Beast: Riding the Rails and Dodging Narcos on the Migrant Trail, the report on the route from Central America to the US that I anticipated reading next. As it turns out, we spent Christmas in San Diego. Or, more precisely, Coronado. (I may say a bit about our trip in a future post or two.) I made some headway on Under Tower Peak on the flight down Monday. At one point, the pilot pointed out Lake Tahoe on the left. Thanks to my seat in row 9 in Alaska’s setup of its 737s, I had no window. I’ll be avoiding row 9 in the future. I could see a bit through the window behind me if I leaned way back, though even then, I had to peek between the wing and the engine if I wanted to see anything not way out to the east. Thus, I never did see Tahoe. But when he pointed out Mono Lake a short time later, I had a perfect view, at which point I realized that I was flying over the very country in which Under Tower Peak takes place—the part of the Sierra Nevada between Reno and Yosemite. That was fun, as was the book, whose main character knows this territory intimately. He is a genuine modern cowboy and an Iraq War vet, at home with guns, horses, and mules, all of which comes in handy. I finished Under Tower Peak on our flight back to Seattle Thursday night. With time to spare, I turned to The Beast. It is not easy reading. Nor did I expect it to be. I’ll get back to it, but Friday night I began looking around for something else. I downloaded the free portion Friday night, read the first tale (that’s all one gets, once one gets past the introductory material), then downloaded the full book yesterday morning and finished reading it this afternoon. The stories are short, the book goes by in a flash. I wouldn’t say the stories show us “how we might find ourselves.” That’s a bit hokey. 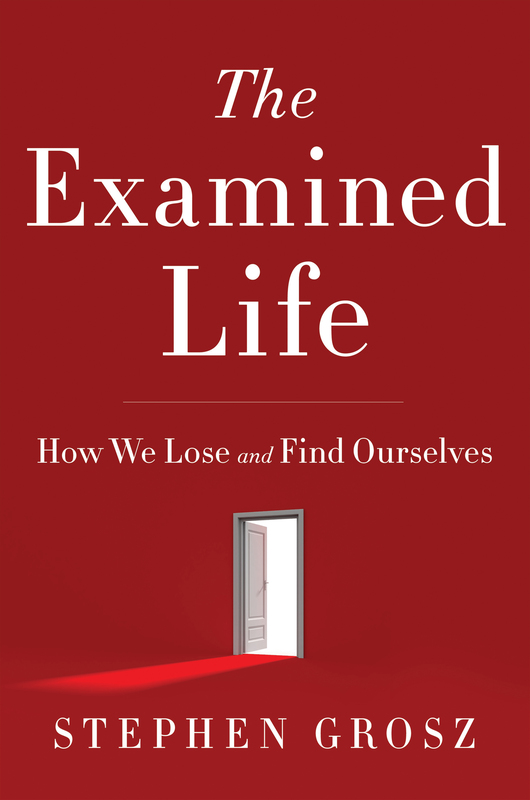 As Kakutani comments, and despite the book’s sub-title, it really isn’t a self-help book. You will not learn to be your own therapist. Rather, it is a compilation of fascinating tales, many marvelously told, some (different ones, I suppose, for different readers) hitting close to home. Grosz is careful to say less rather than more. Many tales reach a climax at a moment of awareness, when the pieces come together. Or at least Grosz suggests that they do, whether for him or for the patient. But he never belabors the point. We rarely see what happened next, if the moment of insight changed the patient’s life significantly or not. One may at times feel cheated, but I came to find that this made the book more powerful. No simple tying everything together, like weekly network TV dramas. I was reminded, in this regard, of a course I took fall semester of my junior year in college. I don’t remember the title, but it was about personality theory, taught by George Goethals, an expert on adolescence. It might just have been the best course I took. There was an extensive reading list. Harry Stack Sullivan. John Bowlby. Goethals offered enlightening lectures twice weekly, supplemented by weekly section meetings. My superb section leader must have been getting his PhD as a therapist, but he was already working full time as a counselor and associate director at a university counseling center with the odd name Bureau of Study Counsel. And he grew up one town away from me on Long Island. Each student, early in the semester, had to write a report about a relationship in the student’s life. Later in the semester, we had to write a second paper applaying one of the theories we had studied in order to shed light on the relationship. There was one more component, and this is what Grosz’s book brought to mind. Six times during the course, Goethals stepped aside, bringing in a psychiatrist and professor at Harvard Medical School to present cases from his own practice. Each hour, he would tell us about a patient, the case history, the treatment, and the result. We had been reading about theory. He was here to tell us about real life, his underlying message being that real life is messy. He organized the cases in descending order, from complete success to total failure. I wish I could remember the details. The last one was absolutely devastating. It involved a patient, a gun, a threat to his own life, maybe ending in suicide. Or perhaps I’m conflating the last two cases, one a suicide the other a threatening patient. The lectures left us shaken. Since Grosz ends his stories in midstream, we don’t know which ones are failures, the revealing moment ultimately less than revealing. But the revelations themselves, some anyway, also have the power to leave us shaken. Milestone, V 9 From L.A.